How can you not bake something from the Pillsbury Dough Boy? I love him. I also love my Wilton Mini Muffin pan. It makes everything taste better. Heat oven to 350F. Spray muffin tray or put muffin papers in pan. Beat cream cheese in a medium mixing bowl with electric mixer until soft. Add egg, sugar and lemon peel. Beat until smooth. Empty pumpkin bread mix into large bowl. Remove 3/4 cup dry mix and set aside in small bowl to make topping. Add milk, oil and egg to remaining bread mix in large bowl. Stir 50 strokes until blended. 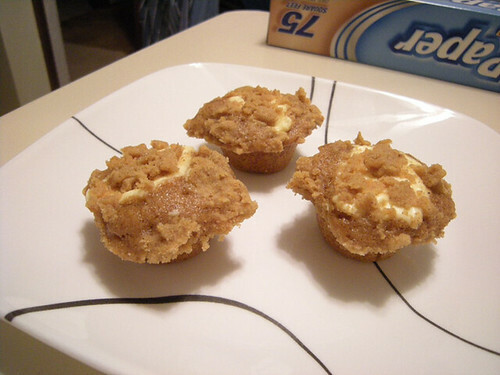 Fill each muffin cup with about 1/4 cup batter (adjust for mini-muffin pan). Make indentation in batter with small measuring spoon sprayed with no-stick spray. Put 1 heaping tablespoon cream cheese mixture in center of each muffin. Add melted butter to reserved dry mix. Stir with fork until crumbly. Add pecans. Crumble about 1 tablespoon over each muffin. Bake for 20 minutes (I baked for 18). Cool 10 minutes in pan. Remove muffins from pan. Place on baking rack to finish cooling. Eat. Store extras (if there are any) in fridge.